Is Chicago the windiest city? For the past four years as sea ice disappears animals that once used the icepack in the Arctic sea are being forced ashore in northeast Alaska. Large numbers of walrus calves have been found swimming along in the Arctic sea. Researchers believe they were abandoned by their mothers as they swam for distant shorelines where they crowd together on dry land. Normally several hundred would gather in colonies on these areas. Instead of the thousands have migrated to these places as the sea ice melts. The Pu'u O'o crater floor on Kilauea collapsed last month. The crater is located on one of the rift zones. When the floor collapsed a new fissure formed that allowed lava to spew out of the fissure up to 100 feet high creating curtain of fire. The increased sulfur dioxide emissions that could be lethal up to 1/2 mile below the crater prompted closure of some hiking trails. The Chain of Craters road is also closed but visitors can go on helicopter rides above the eruption. If you would like to watch the volcano in action Google Hawaiian Volcano Observatory. A bald eagle's nest was found that weighed 4,000 pounds. The Olympic Torch was carried to the top of Mount Everest by Tsering Wangmo, a 23-year-old Tibetan woman. She carried it to the top on May 7, 2008. Pet hamsters are active at night and sometimes run eight miles on the wheels in their cages. The first city to reach a population of one million people was Rome, Italy in 133 B.C. Today there is a city called Rome on every continent. The volume of water in the Amazon River is greater than the next eight largest rivers in the world combined. It also have three times the flow of all the rivers in the United States. The cities of New York and London are moving apart about an inch each year. The North American Plate is spreading away from the Eurasian Plate at the Mid-Atlantic Ridge. Tsunami travel as fast as a jet plane in the deep water of the Pacific Ocean. In this activity you will be collecting sand from different places. You can also have family or friends collect samples of sand for you. 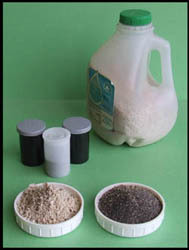 The samples of sand in the picture were collected from Bermuda and the high Cascades in Oregon. Sprinkle a small amount of your first sand sample on a piece of white paper. Look at the edges of the sand to see if they are sharp or rounded. Look at the individual grains to see if they are different colors or a single color. Write information about each sand sample on a separate sheet of paper. List everything that you observe that makes the sand sample different from the other samples of sand you have. Repeat the steps above with your other sand samples. Scientists study individual rock fragments and grains of sand to determine how far they have traveled and where they originated. They also use them to determine the types of rock that produced the sand. Chicago was ranked the 21st windiest city in 1990. There were 68 windy cities in this study. The average wind speed in Chicago is 10.3 mph. Cheyenne, Wyoming was the windiest city with average wind speeds of 12.8 mph. The highest wind speed ever recorded was on Mount Washington, New Hampshire. On April 12, 1934 the wind was clocked at 231 mph on the summit of the mountain. That record still stands today.